People need help. You want to help. And this should be easy. You should be able to simply click a button in Facebook and offer that help. But there are some real creeps out there. They see a tragedy as an opportunity to score some cash – just for being creeps with computers. The hurricane in Texas is no exception. Scammers are out in force. And they have a lot of sneaky tricks to rope you in. Not all of them involve you getting out your credit card. 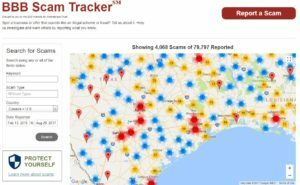 The FTC and Better Business Bureau have issued broad, general warnings to give money only to charities you already know, that have experience in disaster recovery, and that already have an infrastructure in place in Texas. There are a lot of dubious crowdfunding appeals out there. Be very careful of GoFundMe campaigns, no matter how desperate the plea. And, remember, just knowing the person who posted that plea for help in Facebook, does not make it legitimate. 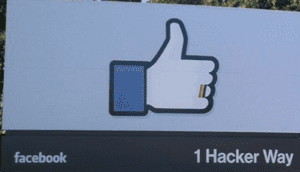 (Hackers break into Facebook accounts. Other people fall for scams.) You can check out charities before giving at the BBB’s Give.org, Charity Navigator, or Charity Watch. It seems harmless and easy to “Like” something on Facebook. But scammers will take advantage of that complacency. They post something that makes you want to react and share. It’s harmless. It isn’t asking for anything. It seems instructive. Why not? After it gets a bazillion likes – or reactions – they edit it so it asks for money or dupes people into downloading something or friending someone. Be stingy with your likes right now. Scammers, or opportunistic advertisers, take advantage of fear and our heightened need to rescue to pose as an emergency response service. They might ask you to retweet or repost their number. Don’t help these people by spreading these ads around. If you are in an emergency, call 911. Are those really your friends? Know someone in Texas? Did they reach out on Facebook asking for money? This is a classic Facebook scam in new clothes. Hackers break into their account and ask all their friends for money. Your friend might be too busy dealing with an actual emergency to check if they have a Facebook emergency. Do them a favor and ask if that’s them begging in Facebook before you give a scammer your money. Phishing always goes crazy after a disaster. You are on high alert, willing to help, and phishing emails have gotten very convincing. Be very careful about opening file attachments, downloading software that looks like a photo, or clicking links in emails. This is how scammers bypass your virus protection: They get you to install their malware for them. Just because it’s a legitimate-looking Web site, it isn’t necessarily a legitimate operation. Security nerds are reporting that lots of URLs with “Harvey” and “Disaster” in them have been registered in the last few days. Some of them take donations. Don’t fall for it. 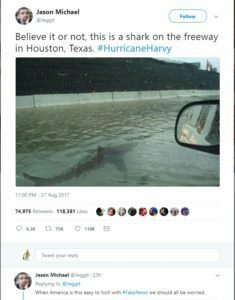 Just because there is a photo of the plane under water or a shark on the freeway, that doesn’t make it true. There are a lot of crazy rumors flying around. Some of them are jokes. Some are fears, amplified. Many have images that are doctored or from previous disasters. Social media makes them fly quickly. Be reasonable. And don’t assume every crazy thing you hear is true. As with all rumors, you have to consider the source, double check, Google it, and maybe check Snopes.